You can improve this rate, Ask for the special promo! Round Transfer in private car included for San Telmo, Downtown, Recoleta, Palermo and Puerto Madero. The Rojo Tango show at the Faena of Puerto Madero is a gourmet, chic and essentially tango experience, exceeding previous expectations. 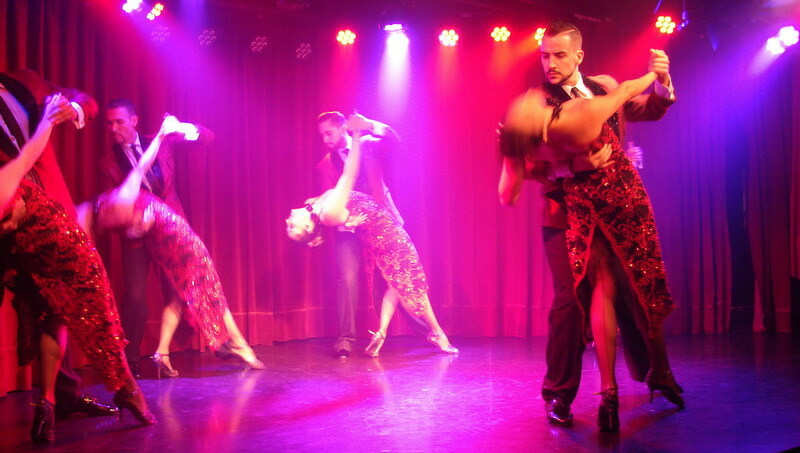 Rojo Tango show is a world-class show that evokes the glamorous times of Tango, dressing the show with the charm of the most exquisite and passionate cabaret. Pick up: Free private transfer for San Telmo, Recoleta, Puerto Madero, Palermo and Downtown. Rates shown have a special discount ask for it! "We experienced an outstanding dinner, wine was excellent. Show was really nice and Pablo (Tango Advisor) put us very close to the stage"
"We were impressed with the fancy place and the show, they picked up us on time. Food was excellent. My husband is musician he loved the music. "This show far exceeded my expectations, which were already high considering the value of the hedged. The professionalism of each member of the staff is remarkable (dancers, artists, musicians, costume designer, diectores, kitchen staff and service). Counting also those behind the scenes, I would argue that there were more people working than spectators enjoying the show. A very intimate show that sensitizes you and amalgam perfectly music and dancing. The singing is excellent couple. not to mention the dancers, where each couple had completely different attributes. The costumes of excellence. Changes were perfect, accurate and on time. Clearly a majestic artistic direction Gastronomy and drinks and first class attention to rise to the occasion. it is certainly a pleasure to be ever given." The luxurious Rojo Tango show is impressive from start to finish; tango passion and glamour of refined cabaret are mixed in a show of only vip service with private transfer, exquisite cuisine and the best champagne in the world. To bring this stunning and luxurious Tango show, the artists make several changes of costumes and dresses (each dress with fifty hours of embroidery for three kilos of Swarosvsky rhinestones) and shoes (all custom and handmade). The show manages to take advantage of the small dimensions of the place and turns the space into an atmosphere, it takes place on the stage, but also on the bar and between the tables, everything happens so close to the public that each and every one of us becomes vip tango people. The dancers have superlative qualities and perform steps which could only be seen in this show. They achieve that each and every one of their "courts" and "streams" can be enjoyed by the public despite the dizzying pace they lead. The choreographies of Tango Rojo wisely mix stage and tango with tango to the floor and achieve very good coordination in group dances, where again the lavish costumes, wigs and headgear play their role in the symmetrical figures. There is profusion of unforgettable images of a very refined aesthetic, the opening looks like a display of life-size dolls like a postcard of all the tango glamour that will come later. Each couple gives a Tango exhibit very well danced, and fundamentally in all the numbers it is to emphasize the passion that the dancers transmit. It is a passionate show, which snatches and involves because it happens around us, it is burning glamour. The couple of singers shines from their voices but also for their acting skills and their duos are shocking. The lady is the perfect singer for this cabaret-style show, a powerful voice and a voluptuous look. The quintet of Tango has a traditional formation and great capacity to execute the tributes to the different orchestras that were consecrated but surprisingly introduces delicious own arrangements. The gastronomy is of a deliberately short menu, only three options for the main and the entrances, betting successfully to the intensity and diversity of the flavor of each proposal. Highlights include the entrance with burratta cheese and prawns. For main, the tenderloin is a tender bit that can not be overlooked, nor the sorrentinos of lamb. To drink Rojo Tango show offers an excellent Malbec Rutini and the best champagne in the world. This Tango Rojo Show in the Faena has all the ingredients for an unforgettable night, well-danced and very passionate tango, glamor, delights for the palate and for the eyes. 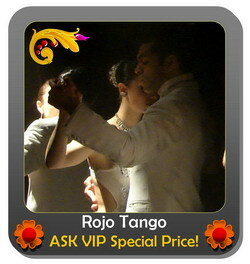 The night at Tango Rojo starts and ends with private transportation as it could not be otherwise for such a high level show.